What is it about an artist’s music that makes it reverberate? Why is there so much music out there but only some of it becomes influential? Is it the glitz and glam? The honesty? The story? I guess it depends on the person. 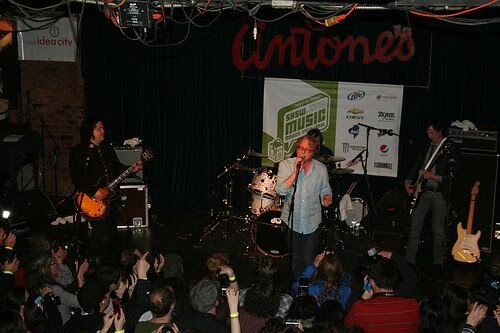 There was a tribute to Alex this weekend at SXSW. Some of his bandmates and friends got up onstage and did the Big Star show that he was scheduled to do. From reports, the place was packed out. No surprise there. It only takes a Google search of “alex chilton influence” to figure out that this dude was a huge part of many musicians lives. I know that rock writers by the millions were crying over Chilton. It’s part of the top secret rock writer training manual. One: Develop a serious habit of some sort (booze, coffee, smoking) Two: Big Star was IT. It’s been a weird year for the so called underground. We’ve been losing influential musicians left and right lately. There’s a sudden collective gasp followed by the sound of people knocking over their cd towers to reach their vinyl collections and drown their sorrows in the songs of dead men. It’s a group thing. All the blogs post the Replacements song for Alex or talk about the last thing the suicidal singers wrote or just how sad it all is. That’s just part of it. I worry sometimes that this generation of mine will not have anyone to miss of our own. Where’s our Alex Chilton? Who are our Billy Braggs and R.E.M.s and Replacements? Will there be anyone that we can all circle around when the time comes, point and say “This is what influenced us all in a small way”? Or will we continue to dive into our niches and only connect with our handful of fellows? At least we’re all easier to find now. Music needs its muses. The Velvet Underground and the Patti Smith records that everyone seemed to have bought at the same time and then formed bands. Something that you’ll put on at three in the morning and listen to in the dark, mouthing the words of the songs and thinking all the while, “This is it. This is me. This is us.” Hopefully, you’ve found at least one. If not, don’t worry. Previous Post Georgia iTunes Takeover! nice post, jordan. most of those bands you mentioned were pretty much ignored at the time they were making music, and weren't considered an influence until long after they were gone. maybe we're just not seeing the real artists. Thank you! The Whigs ROCK!